Hi friends! How was your weekend? We had people over yesterday to watch football and I wanted to make something sweet, festive and easy! 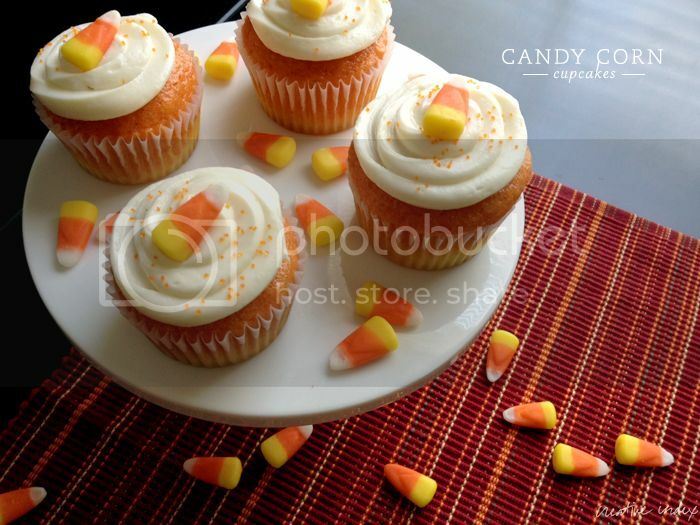 So I decided to make candy corn inspired cupcakes. And for all you candy corn haters, they don't taste like candy corn at all, they just "look" like it. Best of all... they are super easy! Just use your favorite boxed cake mix, color half your batter yellow and half orange and bake! That's it! Preheat oven to 325 degrees. Line muffin tins with white paper liners. Combine all ingredients in a large bowl (except for food coloring and pumpkin pie spice). Beat on low speed for 1 minute. Scrape down the sides and then beat on medium for an additional minute. Spoon in about a tbsp of yellow batter first. Gently tap the pan on the counter a few times to level it out, then spoon about a tbsp or so of orange. Level again if needed. Bake for 18-20 minutes or until a toothpick comes out clean. Remove from oven and allow to cool completely before frosting. Use your favorite canned or homemade frosting. (I love cream cheese frosting, so this recipe is one I use frequently. I also like this vanilla buttercream recipe.) 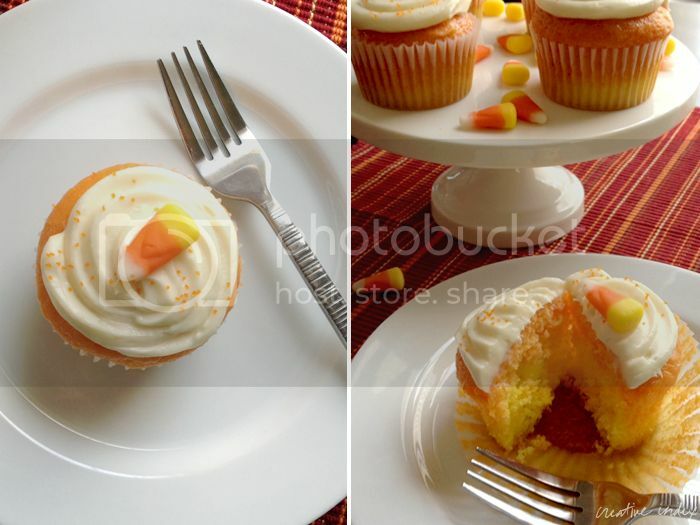 Garnish with candy corn and sprinkles! Now tell me, are you are candy corn lover or hater? I have only eaten them when I´ve been to the States, but they were totally OK with me. These cupcakes look so sweet! I have no idea what they taste like... we don't have them here and if we do I missed that store. These cupcakes can only be an improvement to her crazyness about the "things". Thank you for sharing! There's reason why some call cupcakes happy food. They put an instant smile on my face that's for sure. Have a Wonderful and Happy Week, Sweet Girl! These look SO good! 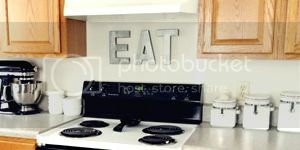 I pinned these right away. Thanks for linking up this recipe! I'm so glad I've been introduced to your blog! I love the ombre effect inside - pretty and delicious! I've never tried candy corn...I'm curious as to what they taste like. These are so fun and festive---I love it! These look fantastic! I love candy corn projects. 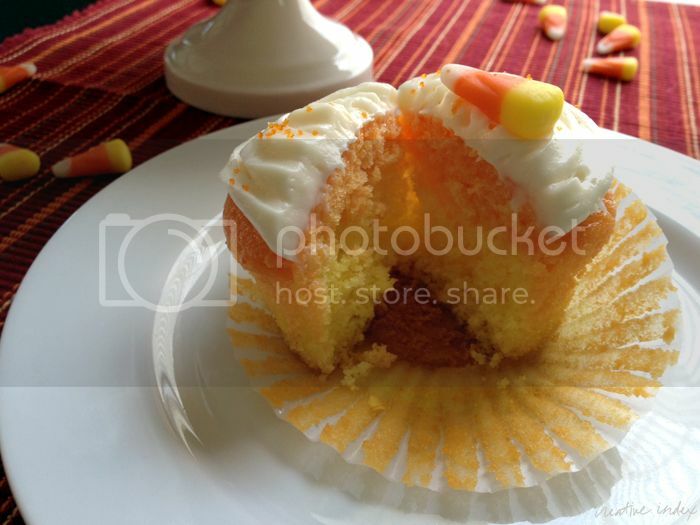 I'm hoping to do a candy corn feature post later this week. If you haven’t already, I hope you’ll visit "One Creative Weekend" on OneCreativeMommy.com (open every Fri-Wed) and link up this idea and anything else you’d like to share. This month there are two categories—one for Halloween and one for everything else. Who hates candy corn??!! Alright, I'll admit those candies are a little gross... but in a good I can't stop eating them kind of way.. lol!